Ben Affleck has become quite the accomplished filmmaker, with each film he has shown amazing chops, growing and expanding as a storyteller. With ‘Argo,’ Affleck steps out of Boston, and shows that the city isn’t his muse, that he can make excellent films no matter where they take place. Argo tells the story of the recently declassified operation that set out to save six embassy staff that escaped the takeover of the US Embassy in Iran, during the Iranian revolution. While the rest of the embassy is taken hostage, the six escapees are taken in by the Canadian ambassador, hiding out till the State Department can come up with a plan. 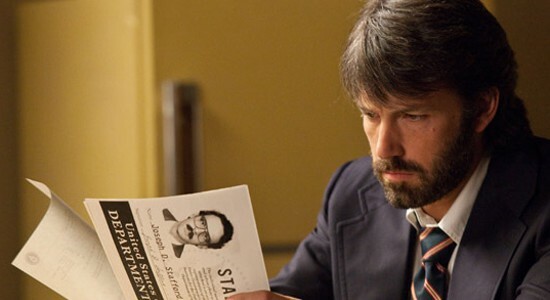 Enter Tony Mendez (Ben Affleck), a CIA specialist who deals with “exfiltration.” His idea is a bit unique, to say the least. He comes up with a plan that involves creating a front for a fake movie, he’ll get to Iran with those credentials, and the six embassy staff members will be part of his “team,” out scouting exotic locations for their sci-fi motion picture. Jack O’Donnell (Bryan Cranston), Mendez’s supervisor gives him a few days to get things set up. Mendez flies out to Los Angeles to enlist the help of John Chambers (John Goodman) a Hollywood make-up artist whose work ranges from disguises for the CIA to the Planet of the Apes. 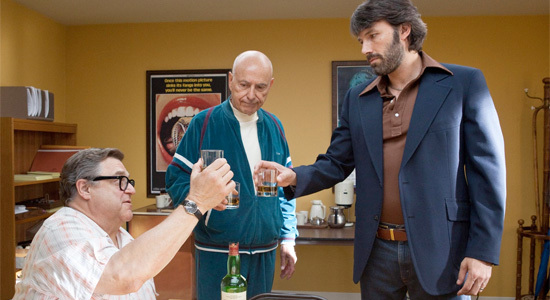 Together they recruit Lester Siegel (Alan Arkin), an experienced movie producer who helps Mendez find and option a script called “Argo,” and get things moving in the press. The group sets up a legitimate office, creates storyboards, as well as holds a press junket and script reading for the film. All in case anything is looked into when he goes to pull the six embassy workers out. The film looks and feels like the late 70s, from costumes, hair (DEFINITELY the hair), to the locations. The entire opening of the siege of the Embassy is executed masterfully. Affleck cuts to recreated “archival” footage that could almost past for the real thing. What I admire most about Affleck’s style of directing is that you can tell he’s draws an incredible amount of inspiration from other films, but you can’t point to a specific shot or sequence and say, this is from “X” movie. He’s great at taking his inspiration and making it his own. The film has an incredible balance of intensity and comedy. While many going to see the film may know how it ends, either way, you’ll be biting your fingernails for the finale. I truly enjoyed this movie, and it makes me excited to see what Affleck does next.